Two names come immediately to mind when one thinks of creative independent horology : MB&F and Urwerk. These two powerhouses have been changing the face of modern watchmaking for years and the Opus V is the first and only collaboration between Maximilan Busser (CEO of Harry Winston Watches before creating MB&F) and Felix Baumgartner (co-founder and master watchmaker of Urwerk) for a result that is nothing short of exceptional. 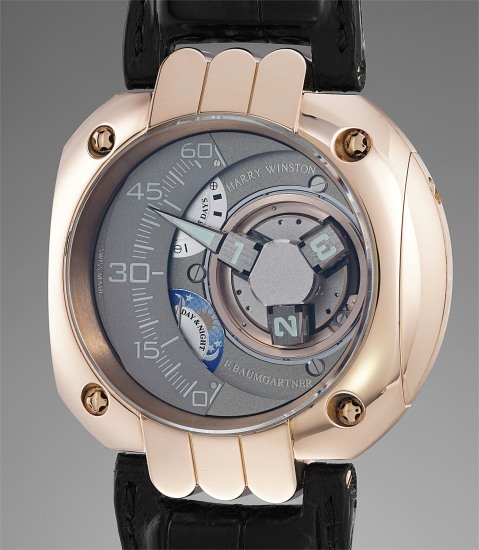 Where the Opus 3, a collaboration with Vianney Halter in 2003, presented the premises of radical horological change, the Opus V is most probably the watch that opened the dams of creativity for budding watch brands who realized that it was possible to be completely free artistically when designing a highly complicated timepiece. A world premiere, time on the Opus V is read via three rotating cubes that indicate the hours, along with a retrograding minute scale. A day/night indicator and a five-day power reserve indicator are also featured. A five-year service indicator, letting the wearer know when it is time for the watch to be taken for servicing is placed on the back (also a world premiere). Opus V was launched in 2005 and remains today, 14 years after its presentation, a mesmerizing horological UFO retaining its WOW factor and ability to surprise and impress. This watch bears the DNA of Urwerk with its unconventional time telling mechanism and bold and dynamic look. The series was extremely limited, produced in just 45 examples in pink gold of which the present watch is number 43 and 45 in platinum along with seven pieces in platinum set with round diamonds, and three examples in platinum set with baguette diamonds, for a total of 100 timepieces. The Opus V over the years has become amongst the most sought after watches in the Opus series and this watch provides a scarce opportunity for collectors of independent watchmakers to own one.